Bacteria grow and divide. It sounds simple. But at the molecular level, even the most simple functions of a cell are surprisingly complex, and, perhaps just as surprising, still largely mysterious. The nature of the peptidoglycan cell wall of bacteria was elucidated in the 1950s. The cell division protein FtsZ was identified in 1980, and atomic structures of FtsZ have been available for more than 15 years. So why do we still not know how these components interact during division to constrict one cell into two? The problem may boil down to a gap in the length scale. At one end, we have knowledge of the location of every atom in many proteins, including FtsZ. At the other end, we have detailed images of whole cells from techniques like electron cryo-tomography (ECT), which is the primary technique employed by our lab. Using ECT, our group and others have visualized the cell-scale architecture of the peptidoglycan cell wall , and the arrangement of FtsZ filaments during division [2,3,4]. The challenge, though, is to bridge these scales, understanding how molecular intricacies give rise to cell-scale processes. To build this bridge, the first author of this study, Lam Nguyen, has been developing methods to explore what has been called the cellular mesoscale . His approach is to translate available biophysical and biochemical information into a cellular model with enough information to realistically simulate the process while still being computationally tractable over relevant timescales, like the course of division. 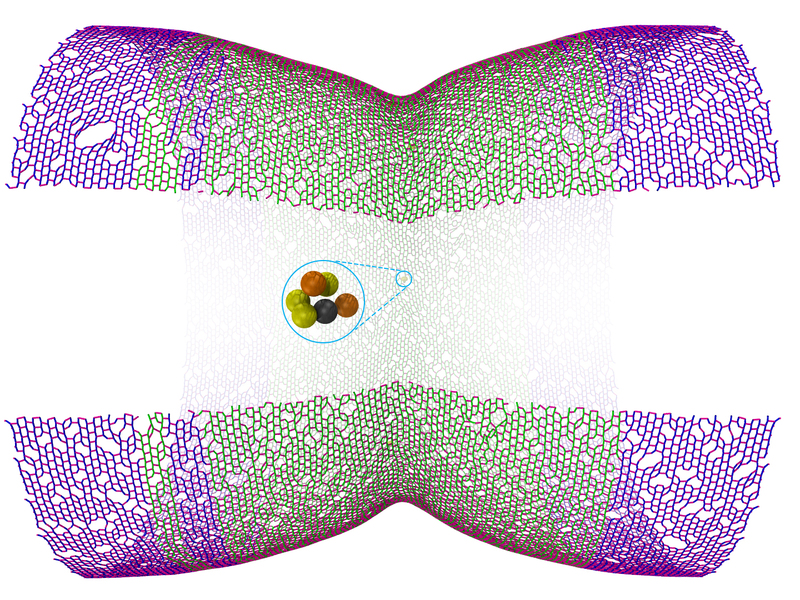 This is known as coarse-grained simulation, in contrast to all-atom molecular dynamics simulations that model the behavior of individual atoms over much shorter (≲1μs) timescales. Visualizing these coarse-grained simulations in 3D can give us a window into the mesoscale we've been missing and is a powerful way to explore conceptual models. Previously, Lam constructed a coarse-grained model of the Gram-negative cell wall, or sacculus, and used it to study how the synthetic enzymes can remodel the sacculus to allow cell growth while preserving the cell's structural integrity and rod shape . Once this model had been used to explore cell growth, the next step was to apply it to cell division. Many mechanistic models have been proposed for how bacteria constrict their cell wall to divide. Some propose that FtsZ generates a constrictive force on the envelope to drive division. Others suggest that FtsZ simply acts as a scaffold to direct cell wall synthesis to the division site. In the work described in this paper, Lam performed a series of simulations, each of which took several weeks to run. In each simulation, he would test a set of assumptions about how the system works, constrained by what we know about its properties from experiments. All told, the project required more than 100 of these computationally-intensive simulations. His next step was to translate the quantitative information generated by the modeling into a visual language that we can interpret. To do that, Lam used VMD to generate images, combined them into animations with QuickTime Pro, added descriptive features in Photoshop, and then used Final Cut Pro to merge the visual elements with narration to produce explanatory movies. These movies offer a tremendous amount of information in an intuitive format. In fact, we think watching the supplementary movies is a better way to understand our simulation papers than reading the text. By modeling the mesoscale, we were able to quantitatively test different mechanistic models that have been proposed. Going further, by visualizing the simulations, we could understand how the models worked (or, in most cases, didn't). For instance, one model proposed that the cell wall grows to smaller and smaller diameter at the division site by laying down new material inside the existing wall before existing bonds are broken. Visualizing this mechanism by coarse-grained modeling immediately showed that it couldn't work (at least with the assumptions we made from existing experiments) due to the effect of turgor pressure on the cell wall. We showed that it could work, though, if there were a constrictive force, possibly generated by FtsZ, to counteract this pressure. We see this project as one of the first steps in an iterative process of experiments and modeling that will eventually, probably decades down the road, lead us to an answer to the simple question of how bacterial cells divide. Taking the next step, we're now running more simulations to explore molecular mechanisms that could explain how FtsZ drives constriction. In the meantime, we hope this story illustrates how useful coarse-grained molecular modeling can be to visualize cellular processes that occur on the mesoscale. 1. Gan, L., Chen, S. and Jensen, G. J. (2008). Molecular organization of Gram-negative peptidoglycan. Proc Natl Acad Sci U S A 105, 18953-18957. 2. Li, Z., Trimble, M. J., Brun, Y. V. and Jensen, G. J. (2007). The structure of FtsZ filaments in vivo suggests a force-generating role in cell division. EMBO J 26, 4694-4708. 3. Szwedziak, P., Wang, Q., Bharat, T. A., Tsim, M. and Lowe, J. (2014). Architecture of the ring formed by the tubulin homologue FtsZ in bacterial cell division. eLife 3, e04601. 4. Yao, Q., Jewett, A. I., Chang, Y. W., Oikonomou, C. M., Beeby, M., Iancu, C. V., Briegel, A., Ghosal, D. and Jensen, G. J. (2017). Short FtsZ filaments can drive asymmetric cell envelope constriction at the onset of bacterial cytokinesis. EMBO J 36, 1577-1589. 5. Goodsell, D. S., Franzen, M. A. and Herman, T. (2018). From atoms to cells: Using mesoscale landscapes to construct visual narratives. J Mol Biol 430, 3954-3968. 6. Nguyen, L. T., Gumbart, J. C., Beeby, M. and Jensen, G. J. (2015). Coarse-grained simulations of bacterial cell wall growth reveal that local coordination alone can be sufficient to maintain rod shape. Proc Natl Acad Sci U S A 112, E3689-3698.